Zane Benefits, the online alternative to group health insurance, announced today the publication of a free eBook "The Employer's Essential Health Care Reform Checklist." 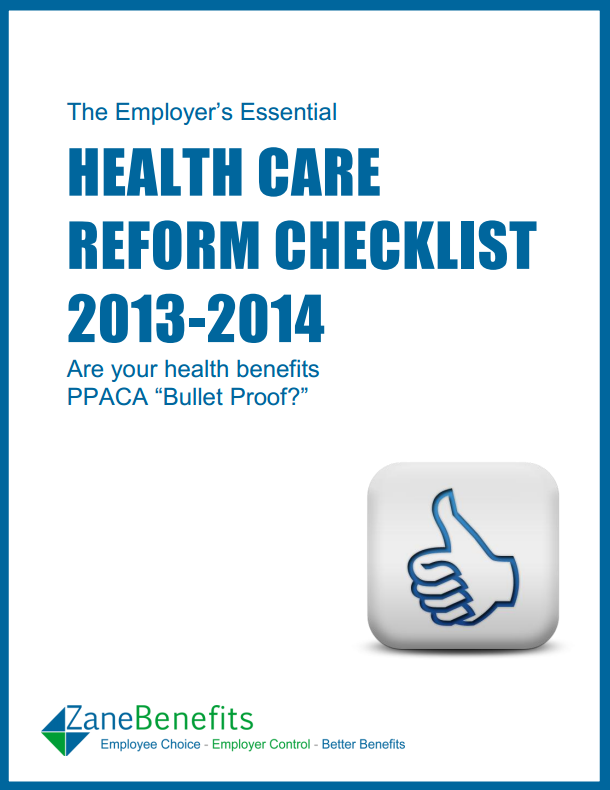 The new eBook helps businesses understand, and ensure compliance with, health care reform regulations in 2013, 2014, and beyond. Implement changes before January 1. Businesses need to act now to ensure compliance with current PPACA provisions and to prepare their employee health benefits for 2014. This top-level guide is written for Business Owners, CEOs, and HR Professionals. The checklist helps businesses ensure compliance with key PPACA regulations, and learn about new cost-saving options for employee health benefits.